The Picture is only for info. Actual layout plan awaited. CONTACT NOW AND BOOK the moment plot plan is released! Location: PLS23 Layout is located 2.5KM before Tukkuguda Junction, right next to ORR. Premium Location. Markets / ORR exit nearby. Drive to adibatla all along ORR only. 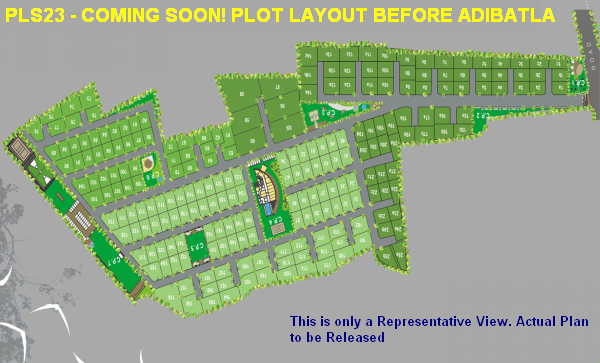 Upcoming Plot Layout before Adibatla gives you opportunity to book at PRE LAUNCH Rate, before HMDA Approval. Adibatala development is Real, not like the proposals made at Fabcity which never materialized. In Adibatla, we see real IT and industrial construction first, followed by real estate activity. Cognizant has started construction work on a 15000 strong Campus. L&T has bagged this contact. TCS Project is nearing completion. Tata Lockheed Martin Helicopter Facility beside the TCS Campus is already exporting Helicopter Parts. Tata Aerospace SEZ has several completed structures already. Samooha Aerospace park is in start-up stage. The ORR Junction before Adibatla is at Tukkuguda. From Tukkuguda to Adibatla is 10KM along ORR. It's toll free drive along Service Road. Over the last few years, Tukkuguda has seen commercial development along the Highway. It's the only large town on Srisailam Highway near Airport. It feeds commercial needs of Hardware Park, Ecity, Factories along Srisailam Highway and also needs of construction projects. Tukkuguda is just 500 meters from Ecity Entrance. It's in Innerside of ORR. The Central Govt has allocated ~900 Cr for development of Electronic City in Tukkuguda in the land formerly allocated to Fabcity. Premium Location from Exclusive Ventures: The project will come up on the leftside of ORR when driving towards Adibatla from Shamshabad. Just 1.5KM before ORR Exit 14, FACING ORR. From your Plot to TCS Drive along ORR ONLY and not inside Roads! Being Before TCS and between TCS and Shamshabad and close to ORR, gives it unique advantage and you can expect very good return. Once Booking Opens, PAY ONLY 2L and Block your PLOT. Pay 35% (less 2L) at time of HMDA Fee Payment Letter and rest 65% by BANK LOAN. We will publish expected RATE little later. It will be very competetive compared to existing projects, in the locality. Pre Launch Buyers will get price advantage. As per the standard pre-launch process, the project will go into HMDA approval after pre-launch. Approval will be definitely received since land is in Special Development Zone where all construction and layout activity are allowed. In the most unlikely event of non receipt of approval, the advance will be refunded. > PRE LAUNCH BOOKING IS OPEN - SUBMIT ENQUIRY!